Jennifer Peedom's documentary on the Sherpas and Nepal is inevitably infused with a bittersweet touch, and is a scathing look at the unfolding industrial dispute on Everest. Armed with a camera crew and with the intention of giving the Sherpas the moment to shine she felt they had been missing all these years, she couldn't have foreseen the tragic events that would brutally interrupt the 2014 climbing season - and after completing editing, the earthquake that struck almost exactly one year on. However, before the tragedy comes the majesty of the mountain, thanks to opening shots that are pristine and clear and which cauterize the eyes with white. As the wind blows against the Everest that we are so accustomed to, which reaches out into the heavens, it soon becomes clear that the serenity is only in the sky. In 2013 the discord on the ground threatened to boil over with a fight brewing between the Sherpas and those climbing the mountain being the final straw. 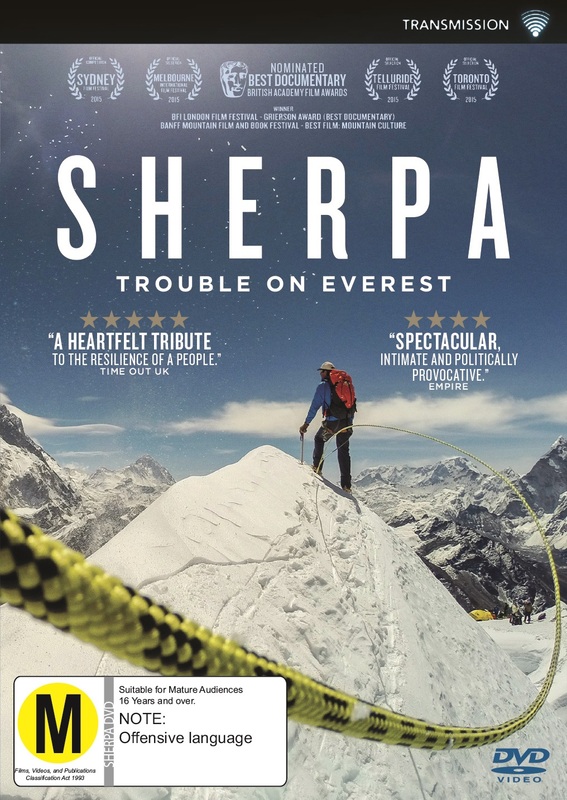 It was this in mind, and Peedom's perception that the Sherpa race has been ignored despite doing the majority of the work that set the documentary in motion. But what emerges from Peedom's utterly thrilling and yet equally sickening piece is the bitter curelty of timing. Against a backdrop of whether the Sherpa are working too hard to capitalise on a season that grants them ten times the average wage and ensures their families have food, nature intervened on 18th April 2014, bringing an avalanche that killed 16 Sherpa and setting the debate into a chain of urgency that's as fragile as the snow hanging on the side. 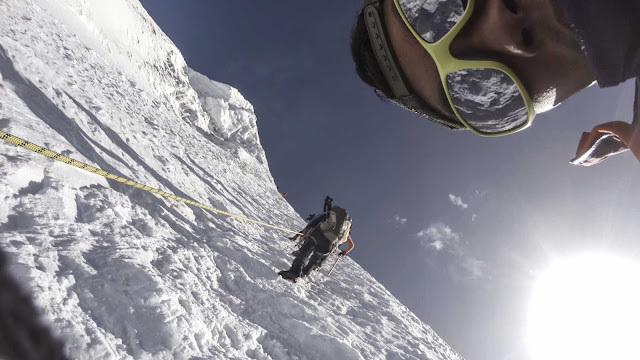 Wisely choosing to follow Phurba Tashi, a Sherpa whose next climb up Everest will mark his 22nd and a world record, as well as Himalayan veteran Russell Brice who carries out commercial ventures with his crew in mind, Peedom's created a documentary that soars as high as Everest itself and scales the heights of cinematic greatness. It may be concerned with matters thousands of metres above ground, but Peedom's non-intrusive eye keeps our feet squarely on terra firma and deals us with the cold hard facts of the inequality of the sherpas; namely, that they have to travel 30 times a season through a moving ice-fall to ensure that those who've paid the big bucks can make one simple trip to the base camp and summit the top. Sherpa is never anything less than shocking as it exposes the widening gap between commercial venture and human life and there won't be many who don't fall squarely into the Sherpas' camp after the tragedy unfolds (that an American client claims terrorists have pushed them off the mountain when the Sherpa essentially strike fearing for their lives speaks volumes to their plight and the Western perception of entitlement). Granted, Peedom's firmly in the Sherpa camp, but even she could have never predicted the sickening urgency that the doco takes when the wall of white comes down (and in its most harrowing moment, covers a camera clearly from the Sherpa team walking the crevices). Her seamless weaving of the now and then of the Himalayas creates a rich timeline, but never loses its focus on the human faces of what is essentially commercial law. Even the Nepali government gets a serve over their apathy in the face of tourism woes, something this polemic subtly plants in your mind. The inequality may be a slap in the face to those who remember Tenzing Norgay's smiling face, but by revealing the years that have been cruel to the race after this, Peedom's created something that's sickeningly gripping and viscerally raw from beginning to end - and which captures an unfolding tragedy in an entirely riveting way but which never loses sight of the human cost or gets caught up in the post-tragedy hysteria. 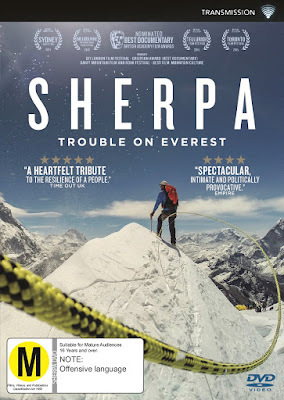 Sherpa is formidable film-making, one whose ending will be changed in light of the 2015 Nepal Earthquake but one whose ethical and moral issues will resonate with many for years to come thanks to Peedom's unswerving eye and concise skill. It's jaw-dropping stuff, and not always for the reason you'd expect. Unmissable.